Pyongyang releases images of missile that resembles Russian KH-35 ahead of US-South Korean military exercises. North Korea has test-fired a new anti-ship cruise missile, images released by state media on Saturday showed, demonstrating the increased capability of the secretive state’s outdated navy. The images were released in the lead-up to US-South Korean military exercises this spring. North Korea routinely seeks to raise tensions ahead of the annual drills, although this year Pyongyang has also offered to suspend nuclear testing if Washington calls off the exercises. 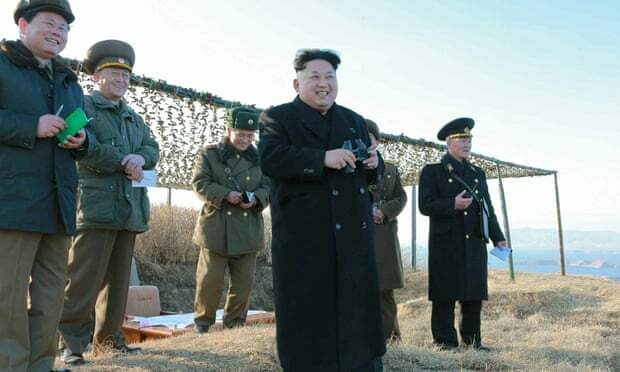 The images, which were shown on the front page of the ruling Workers’ Party Rodong Sinmun newspaper, showed leader Kim Jong-un observing the missile being fired from a small naval vessel. State media described it as a “new type of cutting-edge anti-ship rocket” developed by North Korean scientists that will “bring a great change in the navy’s defence of territorial waters”. The missile appeared identical in design to a Russian anti-ship missile, the KH-35, which is capable of flying at high speeds metres above the sea. “It looks exactly like a KH-35,” said Jeffrey Lewis of the California-based Monterey Institute of International Studies. Last June, Lewis was the first to spot what appeared to be an unconfirmed glimpse of the missile in a North Korean propaganda video. “It is a capable anti-ship cruise missile that puts some teeth in recent statements about developing anti-ship capabilities,” said Lewis, referring to North Korean naval exercises last month that state media said were designed to target US aircraft carriers. North Korea has increased the number of air and naval military drills in recent weeks, ahead of the annual US-South Korean military exercises on the Korean peninsula. Pyongyang regularly protests over the drills, which it says are a rehearsal for war. Officials from isolated North Korea, under increased pressure from international sanctions related to its nuclear and missile programmes, have made frequent trips to Russia over the past year, where leader Kim Jong-un is scheduled to make his first official state visit this May. “The design raises a question about whether, when, and under what circumstances, Moscow might have assisted North Korea in the development of the system,” Lewis said.